Cheong Kwan Jang, owned by Korea Ginseng Corp. is the most well-known Korean red ginseng brand name in Korea and has seen its exports surpass $100 million this year. According to Korea’s biggest ginseng maker, its exports reached $115 million as of October and were expected to exceed $128 million by the end of 2011. As a first among all Korean health foods, Cheong-Kwan-Jang brand ginseng has been sold through Harrods Department Store in the UK, amongst other prestigious department stores throughout the world. More than 50 Cheong-Kwan-Jang brand stores have been established in eight countries such as the United States, Japan, Hong Kong, Taiwan, Vietnam, Australia and others. In 2009, by achieving Saudi GMP (Good Manufacturing Practices), Cheong-Kwan-Jang is even gaining a foothold in the Middle East. 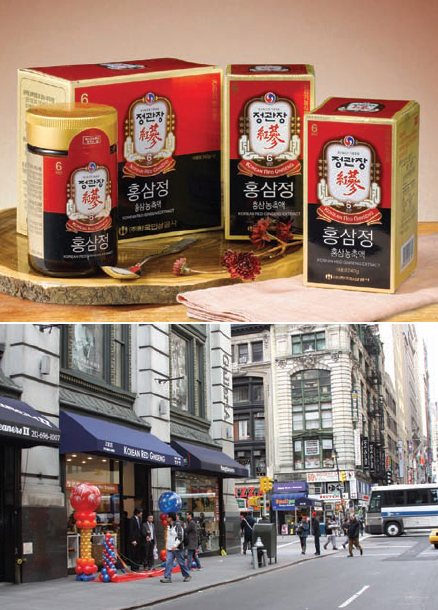 In fact, in the United States, Korea Ginseng Corp. has 17 brand stores that sell Cheong-Kwan-Jang exclusively as of the writing of this article. Stringent control of raw materials guarantees high quality Under KGC’s raw material procurement system, a steady supply of high quality six-year-old ginseng roots is guaranteed through contract farming (about 6.880ha). Accredited as a GPA organization by the Korean government, KGC is known to maintain the highest quality through stringent control over the entire process, from managing soil conditions in designated plots and the actual farming to technological guidance and support related to the government purchase scheme. Trusted for over a hundred years, Korea Ginseng Corp’s Cheong-Kwan-Jang ginseng uses only six-year-old Korean red ginseng cultivated in Korea, where soil and weather conditions make it the most ideal place in the world for growing ginseng. Korea Ginseng Corporation thoroughly inspects the soil designated for cultivation for any contaminants prior to selecting a suitable site for the six years required to cultivate ginseng. KGC guarantees the safety of all Cheong-Kwan-Jang products by carrying out ginseng sample analysis, soil analysis and cultivation method education throughout the cultivation period. The cultivation technology we use for preparing and processing Korean red ginseng has a history of more than 100 years of scientific development. The production is done within state-of-the-art facilities, the world’s largest ginseng factory, and it guarantees that the quality of the product materials of Korea Ginseng Corp cannot be imitated by any competitor. Additionally, KGC combines the traditional methods with the latest high-tech facilities and strict quality control system. In this process, carefully selected six-year old fresh ginseng is steamed with vapor. Then, the red ginseng is manufactured with less than 14% humidity through natural drying. The fresh ginseng becomes red ginseng as characterized by a liver-brown color. The original shape of the ginseng is maintained by removing and trimming the fine roots. Afterwards, they are sorted into the Heaven, Earth, and good classes and are vacuum packed. The other various products by Korea Genseng Corporation are labeled as Cheong-Kwan-Jang Red Ginseng that cannot be imitated by any other ginseng manufacturer. control. Each root is cared for and monitored for six years of its cultivation and growth in pre-approved and carefully graded farms. Its farms operate on contract after extensive testing of the soil, ensuring that fresh land is used under the most natural conditions. KGC has spent about 2% of its revenues on R&D investment and its research center has 100 competent researchers who are committed to studying the efficacy of Korean ginseng and Korean red ginseng and developing the Korean red ginseng products. As results of these endeavors, it achieved the patent applications and registrations: 192 (as of Dec. 2008) and 344 articles presented (2000-2006).